But what irked Steyn the most was the idea that the United States had to import an Englishman to sound off about the country’s current affairs. At a time when the federal government is facing fiscal challenges, it is receiving record amounts of revenue from at least one source: criminal fines and penalties paid by major corporations. UBS joined a long list of companies that have shelled out billions of dollars in criminal fines and penalties to the U.S. government in 2012. In July, the British drugmaker GlaxoSmithKline agreed to pay a $956 million criminal fine to settle a healthcare fraud case. And in September, the Taiwan-based AU Optronics Corp was fined $500 million for price fixing in the market for liquid crystal display panels. Well, it depends. Penalties, which don't involve a conviction, mostly go directly to the U.S. Treasury. On the other hand, fines imposed on individuals and companies convicted of federal crimes are mostly deposited into a pool called the Crime Victims Fund. The fund was established by the Victims of Crime Act of 1984 to fund state-run victim assistance and compensation programs. They cater to victims of a wide range of crimes, including child sexual abuse and domestic violence, but not the actual victims of corporate fraud. In the fund's most recent fiscal year, which ended on Sept. 30, it took in a record $2.7 billion, ending the year with a total of more than $8 billion. But while the fund is taking in record amounts, its spending is not keeping pace because of limits set by law. In 2000, Congress set caps on the amount the fund could spend each year as a way to provide more stability in the future. While the cap has been raised several times over the last 12 years, it has stayed at $705 million a year for the last three fiscal years. That cap will remain in place under an agreement between Congress and President Barack Obama that keeps the government running at current spending levels through March 27, 2013. Steve Derene, executive director of the National Association of VOCA Assistance Administrators, whose members administer money from the federal fund, is hoping that Congress will raise the cap. He said as a result of the limits, grants made by the fund in 2012 were actually 30 percent less, in real dollars, than 2000 grants. "The fund itself is not running short," said Derene. "Our problem has been getting money out of the fund for victims services." While the fund is doing well, it is nevertheless losing out on many major criminal penalties collected by the Justice Department. When companies sign non-prosecution agreements or deferred prosecution agreements, they often agree to pay a penalty as opposed to a fine. Such penalties go directly to the U.S. Treasury, not to the fund. UBS, for example, agreed to pay $400 million as part of a non-prosecution agreement. That money will go to the Treasury, said Derene. Only a $100 million fine that UBS Securities Japan Co, Ltd, agreed to pay as part of a guilty plea will go into the Crime Victims Fund. Derene said he's concerned that more and more money will not make it into the fund as a result of non-prosecution and deferred agreements in which companies pay penalties. "They're the functional equivalent of a fine," said Derene. WASHINGTON – Documents provided to Senator Chuck Grassley suggest that a gun purchased by George T. Gillett may have been found at the scene of a Mexican shootout between drug cartel members and the Mexican military. Gillett was the Assistant Special Agent in Charge of the Phoenix office of the Bureau of Alcohol, Tobacco, Firearms and Explosives (ATF) during the Fast and Furious scandal, where the federal government allowed nearly 2000 guns to be bought by straw purchasers and transported across the Mexico-U.S. border. The weapon apparently purchased by Gillett was recovered in the same area and on the same weekend as an AK-47 purchased by Uriel Patino was recovered. Patino was the most prolific straw purchaser in Fast and Furious, buying 720 guns under the federal government’s eyes. The Firearms Transaction Record which suggests Gillett was the purchaser of the weapon is one of three such records in Gillett’s name which list a non-residential address. The Firearms Transaction Records list the addresses of the ATF office as well as a local shopping center. Using false home residences on Firearms Transaction Records is a felony. Jaime Avila, the straw purchaser of a gun found at the murder scene of Customs and Border Patrol Agent, was recently sentenced to 57 months in prison for using false addresses on the same form. In a letter to the Department of Justice Inspector General, Grassley asked the IG to thoroughly investigate the matter. Grassley also has informed the ATF of the weapons that were apparently purchased by an employee, using false home residences, and are now being found in Mexico. Gillett is still employed by the ATF, despite being recommended for disciplinary action by the IG. Here is a copy of the text of Grassley’s letter. A copy of the signed letter and attachments can be found here. Rep. Blake Farenthold, a member of the House Oversight and Government Reform Committee, tells Newsmax that allowing weapons intended for Libyan rebels to fall into the hands of jihadists indicates a “fundamental flaw” in our foreign policy. Farenthold was first elected to the House in 2010. He was re-elected this year and is a member of the Tea Party Caucus. The New York Times reported on Thursday that the Obama Administration gave the go-ahead for weapons to be shipped from Qatar to Libyan rebels last year, and those weapons apparently wound up in the hands of Islamic militants. In an exclusive interview with Newsmax.TV, Farenthold comments: “It indicates a fundamental flaw with our overall foreign policy. As we’re watching the Arab Spring develop in the Middle East, we’re not sure that the winners in this are going to be our friends. Asked if there will be a House investigation of the arms transfer, Farenthold says: “I would imagine as the evidence comes in, if it’s as bad as I have a hunch it is, there will be an investigation. All we’ve seen on this is the open source intelligence, or at least all I’ve seen on it is the open source intelligence, from The New York Times. This week House members had a briefing with James Clapper, the Director of National Intelligence, and other members of the intelligence community – FBI and CIA. The topic was the terrorist attack on U.S. diplomatic personnel in Benghazi. Farenthold tells Newsmax: “It was clearly beneficial to see what was going on and you could tell from the questions that were asked by members of Congress from both parties that there is dissatisfaction with the way it was handled, both as it was happening and probably more so in how it was inaccurately related to the American people by Susan Rice and others. As for Susan Rice’s possible nomination to replace Hillary Clinton as secretary of state, Farenthold says: “Quite frankly, if I were a senator, I wouldn’t vote for her confirmation based on what I know now. But if you continue the investigation, it could go either way. Asked what is the next step in the Benghazi probe, Farenthold responds: “The appropriate committees are going to continue to look into it. The Intelligence Committee. We’ve had a hearing on the Oversight and Government Reform Committee on which I sit. He used a Bushmaster rifle. He broke in through a window. It is unclear if Adam Lanza even had a girlfriend. He is alive and has released a statement of condolence. There was no second gunman. Police incorrectly told multiple media outlets that Ryan Lanza was the shooter, when in fact the shooter was Adam Lanza. More on this here. One of these explanations must be incorrect. Secretary of State Hillary Clinton has announced another sudden illness, marking the third time since Sept. 11, 2012 that she has distanced herself from President Barack Obama’s faltering Muslim-outreach strategy. The illnesses — and her pending departure from the job — have protected her from growing criticism about the Middle East strategy, which has helped Islamic theocrats seize or consolidate power in Egypt, Libya, Tunisia, Turkey, Mali and Iran. This distancing may prove particularly useful in 2016 if Clinton decides to run for president. Obama’s 2009 policy, dubbed “A New Beginning,” gambled that the region’s popular Islamist movements would become more moderate if allowed to gain power. Under the strategy, moderate Islamist governments would focus their efforts on economic development and suppress their ideological allies in al-Qaida and other jihadi groups. The State Department suggested Clinton would eventually testify, but did not say when. The Senate is investigating her agency’s actions prior to the successful Sept. 11 jihadi assault on the poorly-guarded U.S. diplomatic facility in Benghazi. The assault killed four Americans, shut down the only known U.S. facilities in eastern Libya and bolstered the local jihadi groups’ leverage against Libya’s weak government. Critics say the administration left the sites vulnerable because it was wanted to believe that Libya’s weak Islamist government would successfully corral the jihadi groups proliferating around Benghazi. Earlier in the week, Clinton’s deputies said the stomach ailment had forced her to skip a Dec. 13 international meeting in Morocco, where the administration and other governments planned to announced their backing for a Syrian rebel coalition. The American Conservative Union lobbying group sent out a fundraising email Thursday afternoon calling attention to collaboration between Media Matters and the United States Department of Justice. “The liberals at Media Matters have just been caught conspiring with the Obama Justice Department in an aggressive and deceitful attempt to discredit Fox News reporting!” reads the email from ACU Executive Director Gregg Keller. While Keller suggested the two organizations “have just been caught,” The Daily Caller first reported in September on regular collaboration between Attorney General Eric Holder’s communications staff at the Justice Department and the left-wing advocacy group Media Matters. Emails obtained by TheDC through a long-delayed Freedom of Information Act request revealed multiple instances where a Justice spokeswoman would work together with a Media Matters staffer to diminish news stories critical of the Department — particularly those stories related to Operation Fast and Furious. “If she does not resign or is not terminated, it will be a sign that Eric Holder approves of such abuses and sees nothing wrong with using government resources to attack his own employees as well as reporters, ordinary citizens, and others doing their jobs or exercising their right to report or criticize the conduct (and misconduct) of the Justice Department,” wrote Spakovsky. But Schmaler hasn’t gone anywhere — she’s spoken to the press on behalf of the Justice Department as recently as Wednesday, but did not respond to a request for comment for this report. Neither did Jess Levin, a spokeswoman for Media Matters. “It is another sign of the politicalization (sic) of DOJ and how low it has sunk,” he said, via email. Such discrepancy in editorial judgment is often the basis for Media Matters’ attacks on the Fox News Channel. The group regularly accuses the network of over-covering news that doesn’t advance the Democratic agenda — or under-covering news that does. If Media Matters did come to Crowder’s defense, it wouldn’t be the first time the organization attempted a principled stand on behalf of a political opponent. “There are a lot of legitimate reasons to criticize Sarah Palin, her new book, and her policies, but you don’t have to stoop to sexism to do it,” Media Matters writer Julie Millican wrote then. Media Matters appears to be joined by a fairly solid coalition of liberals who have chosen to ignore Tuesday’s attacks. A spokeswoman for Media Matters did not respond to a request for comment from The Daily Caller. With all eyes on the fiscal cliff, will Congress sneak through agri-corporate-welfare? Come midnight, on December 31, absent congressional action, we’ll get a lot of policy changes. The Bush-Obama tax rates might end, hiking taxes on everyone who pays income taxes, and some who don’t. The payroll tax holiday will end, adding more tax hikes. “Sequestration” will kick in, slashing military spending. But did you know that at the end of the month, the current agriculture legislation expires, too? All sorts of farm subsidies would expire. Some would revert to older subsidies. Farm income has soared, tripling over the last decade. Even this year, despite a historic drought that withered much of the corn and soybean crops, farm income is projected to stay high, thanks in part to the generously subsidized federal crop insurance program and the corn ethanol mandate. It makes no sense that federal subsidy dollars go overwhelmingly to the largest, most successful landowners and farm operators — precisely those who need it least. Since 1995, the top 10 percent of farm subsidy recipients have cashed 74 percent of all subsidy checks. In 2011, for instance, 26 individual holders of crop insurance policies collected more than $1 million each in subsidies to help pay their insurance premiums. Neither the House nor Senate bills would do enough to rein in these lavish handouts. They do take the positive step of ending one type of farm subsidy — the discredited and wasteful direct payment program — but both proposals turn right around and funnel most of the savings into other new or expanded subsidies. In fact, if prices for major crops such as corn, soybeans and wheat drop even modestly from their current record levels, those new House and Senate subsidies would be very costly for taxpayers and do nothing for the budget deficit. The Chicago law firm that auctioned the assets of failing battery maker A123 Systems Sunday to the Chinese company Wanxiang Group is a major Obama campaign donor, records reveal. A123 received $249 million in funds from President Obama’s 2009 stimulus package, and spent at least $132 million of those funds to build two factories in the Greater Detroit area. The company’s bankruptcy and sale to Wanxiang Group means that the Chinese company now owns all of the properties A123 purchased with its stimulus money. Latham and Watkins, which conducted A123′s bankruptcy auction in which Wanxiang Group beat out Wisconsin-based Johnson Controls and another company, contributed $208,244 to Barack Obama in the 2012 election cycle. Wanxiang Group’s U.S. headquarters are based in Chicago. The company claims that the A123 acquisition will “accelerate its growth” in the alternative-fuel industry, according to the New York Times. U.S. Senators Chuck Grassley and John Thune expressed concern about the acquisition Monday. A friend from Chicago, involved in Illinois politics who has known Obama since his early days in the Illinois State Senate, told me that two things that trump everything else in Obama’s mind: redistributing the wealth and empowering labor unions. Look at everything the President does, my friend says, and you will find one or the other lurking in the background. My friend’s analysis may explain a lot about the current state of affairs concerning the standoff over the so-called fiscal cliff and Obama’s refusal to abandon the idea that he must raise taxes on the rich. The President and his henchmen certainly understand that raising taxes on the richest 2% of taxpayers (in reality these people are not the richest but those with the highest incomes) makes little economic sense – doing so would reduce the deficit for 2012 from $1.10 trillion to $1.02 trillion or, in these numbers, really not at all. So something else is going on. There is no question that there is plenty of politics going on, for one thing. Obama didn’t learn how to play politics in Chicago for nothing, and he didn’t come out of his second successful presidential campaign without realizing how to hoodwink the voters while putting Republicans over a barrel. As squishy Republicans begin to agree with him that maybe, just maybe, we could raise taxes just a little bit Obama understands that if he wins on this one, he’ll be able to push Congressional Republicans around for the rest of the Congress. Obama is also an ideologue, and has made no bones about his intent of transforming the country into his vision of a socialist, or near-socialist, paradise. First on the list is to redistribute the wealth, best done through the tax code. It can also be done by eliminating loopholes and deductions (especially those most often used by the rich) and reforming the tax code, which is exactly what Obama proposed in July of 2011. But now that John Boehner is proposing it, Obama resorts to Chicago politics and refuses to even consider that, and refuses as well to even consider cutting spending knowing that when Boehner caves, Obama can get a start at wealth redistribution and leave the mess that follows to his successor, whoever that may be. Obama and the Democrats would very much like to get the fiscal cliff – debt limit – defense sequester debate out of the way so they can move on to other things. They all understand the dynamics of a second term, how miserable it can be, and how soon anything productive they have in mind for the country grinds to a halt. They all know that effectively they have about 14 months to get anything done, as by March of 2014 the fall Congressional elections will be the first – or only – thing on their minds, and everything they do will be geared toward re-election. Just ask Lyndon Johnson, or Richard Nixon, Bill Clinton, George W. Bush – and even Ronald Reagan. All had big trouble in their second terms, and all lost plenty of seats in Congress in that awful sixth year. Neither Congressional Democrats nor Obama want to be raising taxes, arguing about Medicare and Social Security, or voting on the debt limit any closer to November 2014 than possible. Losing issues, particularly in an off-year election. In his Saturday radio address to the nation on December 8, Obama said that there is still some wiggle room on what Democrats are willing to give in negotiations over the “fiscal cliff.” But increasing taxes on the wealthy, he stressed, is “one principle I won't compromise on.” In Obama’s world, in other words, ideology trumps the good of the nation anytime. The top Republican and Democratic senators on the Environment and Public Works Committee released dueling videos to their respective audiences at the UN Climate Change Conference in Doha, Qatar, Thursday. 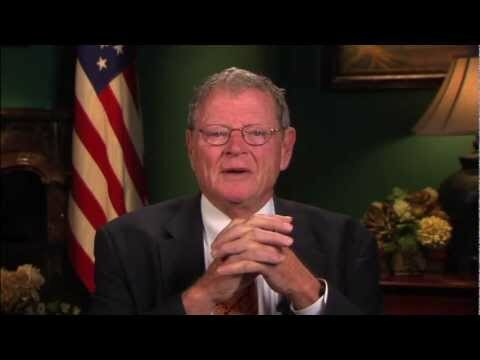 In his video, played at a global warming skeptic event near the conference, Oklahoma Republican Sen. James Inhofe, the ranking member on the committee and a vocal opponent of the green agenda, accused the Obama administration of “quietly handing over billions of dollars to the United Nations in the name of global warming” and explained that he believes the true goal of international conferences like Doha is wealth redistribution. Boxer said that the country, due to new regulations, is on track to reduce carbon by nearly 17 percent by 2020 and that Obama have voiced his commitment to confronting climate change. She focused on the way in which Sandy has affected public perception of the issue. “I believe Superstorm Sandy will mark a turning point in our approach to climate change. Some people may choose to close their eyes, but anyone with a heartbeat and a pulse can see that things are changing for the worse, and we simply cannot afford to ignore these warnings,” she said. “Sandy was a single devastating storm, but scientists tell us that these destructive events will only get worse in the future if carbon pollution continues to increase,” Boxer added. Alternately Inhofe, stressed that the public is not paying attention to the conference this year, because the idea of climate change has been discredited. 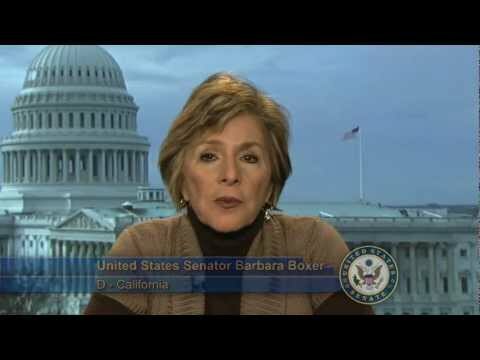 Still, Boxer asserted, there are those who are serious about confronting the climate change. “I want to send a clear message to the conference that there are leaders in Congress who understand the urgent threat facing the globe, and we are dedicated to preventing the terrible impacts of unchecked climate change,” she said. When he kicked Representatives Justin Amash (R-Mich.) and Tim Huelskamp (R-Kan.) off the Budget Committee, Speaker of the House John Boehner (shown), a Republican from Ohio, also kicked up a firestorm of controversy, riling up the libertarian wing of the GOP. Upon arriving at the speaker’s office, a Boehner spokesman refused to answer the protestors’ complaints, relying on the safety of the “armed guards” that surrounded the group. Heritage Action accused Boehner of trying to find “creative ways to fund” President Barack Obama’s “big-government agenda.” The group also compared Boehner with someone who notoriously broke his no-tax pledge: the nation’s 41st president. In a letter to Speaker Boehner, FreedomWorks President Matt Kibbe writes: "We applaud these three constitutional guardians for taking principled stands against bloated bills that would cripple our economy and add to our national debt. These men are voting the way that they promised their constituents they would — on principle. I strongly urge you to restore Congressmen Amash, Huelskamp, and Schweikert to their respective committees." Yesterday the three of them purged fiscal conservatives from committees as punishment for being authentically fiscal conservatives. On the same day John Boehner, Eric Cantor, and Kevin McCarthy punished fiscal conservatives for standing up for their convictions, they sold out their own convictions by agreeing to raise taxes by $800 billion. They intend to seem reasonable to the press in negotiations with the White House. They’re going through an elaborate kabuki dance, but they’ll get blamed nonetheless. Pointing their fingers as fiscal conservatives now punished, casting them out as scape goats, will do nothing to woo the media or the White House, but we should be thankful. We should absolutely be thankful for these three men. As the sun rises this morning we can look at John Boehner, Eric Cantor, and Kevin McCarthy and know the opposition is not just across the aisle, but in charge of our own side in the House of Representatives. All the time and energy I would otherwise have to spend to convince conservatives that these gentlemen would be a problem for the GOP has been spared. They’ve proven it themselves. “Conservatives must seek retribution or become the paper tiger John Boehner, Eric Cantor, and Kevin McCarthy just declared them to be,” Erickson added. Boehner has so far ignored the backlash from his heavy-handed purge of members of his party that refuse to demonstrate blind obedience to his every declaration. Rumor has it that I’ve been removed from the House Committee on the Budget. Remarkably, I still have not received a single call, e-mail, or text from Republican leadership confirming this story. In fact, I wouldn’t even have learned about it if not for the news reports. I look forward to hearing from my party’s leadership about why my principled, conservative voting record offends them. That’s sure to be a lively and entertaining conversation. In the meantime, I can only speculate as to what specifically would make Republican leadership punish several of its party’s most principled members. Rep. Tim Huelskamp, who was kicked off of both Budget and the Committee on Agriculture, voted with me against the 2013 House budget resolution because it does not sufficiently address the federal government’s debt crisis. That was one of only three times during this Congress that I voted against the Chairman’s recommendations in committee. In fact, I voted with the Republican Chairman more than 95% of the time, and I have voted with my party’s leadership more than three-quarters of the time on the House floor. What message does leadership’s heavy-handedness send? It says that independent thinking won’t be tolerated, not even 5% of the time. It says that voting your conscience won’t be respected. It says that fulfilling your commitment to your constituents to work with both Republicans and Democrats to reduce our debt takes a back seat to the desires of corporate special interests. And, most troubling for our party, it says to the growing number of young believers in liberty that their views are not welcome here. I’ll miss working with my colleagues on Budget. I don’t relish this situation, but if one thing is clear based on the response from the grassroots, it’s that leadership’s actions will backfire. If they think kicking me off of a committee will lead me to abandon my principles or stifle my bipartisan work toward a balanced budget, I have a message for them: You’re dead wrong. Kansans who sent me to Washington did so to change the way things are done — not to provide cover for Establishment Republicans who only give lip service to conservative principles. If the rest of America is anything like the 700,000 Kansans I represent, then they know that the fiscal and cultural crises facing our nation require drastic changes to the way things are done in Washington — not just symbolic gestures or more of the same. By their fruits ye shall know them. Boehner now has shown unmistakably that he will not tolerate colleagues who place fidelity to their oath of office above toeing the party line. For weeks, Democratic aides and banking lobbyists have denied claims that the financial industry was working to block Sen.-elect Elizabeth Warren, D-Mass., from winning a seat on the Senate Banking Committee. Those denials were buttressed this week by Democratic aides who said Warren will receive a seat on the panel after indicating she wanted one. That move is no surprise: Boston has a large financial sector and Warren’s work setting up the Consumer Financial Protection Bureau make her a no-brainer for the panel. Senate Majority Leader Harry Reid, D-Nev., has not yet set a date for formalizing Democratic chairmanships and committee assignments, but official assignments are not expected until early January. Sen. Joe Manchin, D-W.V., is also expected to receive a seat on Banking, aides said. Contrary to reports that unidentified banking lobbyists hoped to block Warren, industry sources and Democratic aides have insisted they know of no such effort. And Democratic aides said leading Democrats were eager to put Warren on a panel that fits her background. Banking is a fairly influential committee but not considered as influential as the tax-writing Finance Committee and, arguably, Appropriations. Senate Democratic Policy and Communications Chairman Chuck Schumer, D-N.Y., who has ties to Wall Street, helped recruit Warren to run for office. Schumer has not denied claims that he hopes eventually to succeed Reid as Democratic leader. Hence the New York senator is interested in winning the support of senators like Warren. There could still be more changes to the Banking Committee. The two slots taken by Warren and Manchin will fill seats vacated by retiring Sens. Daniel Akaka, D-Hawaii., and Herb Kohl, D-Wis. But members often cycle on and off the committee each congress. In addition it’s unclear if the panel’s ratio of Democrats to Republicans will remain 12 to 10. Because Democrats made gains in the Senate in the November elections, the Democrats could gain a seat or Republicans could lose one, leading to a further shake up in the panel’s composition. Despite over 2,000 pages of legislative text, many key details of President Obama’s national health care law were left up to regulators to work out, with Secretary of Health and Human Services Kathleen Sebelius given the lead role. The Obama administration wanted to avoid issuing potentially controversial health care regulations during an election year, but now that it’s over, regulations are starting to roll out. In a news dump this past Friday afternoon, HHS released 373 pages of new insurance regulations, and buried on page 299 is a proposed 3.5 percent monthly “user fee” to be levied on the premiums collected by insurers who offer policies on the new government-run exchanges. Effectively, it’s a regulatory surtax that will inevitably be passed onto individuals who purchase insurance on these new exchanges. When Obamacare was written, Democrats envisioned new health care exchanges in all 50 states, plus the District of Columbia, in which individuals (based on their income level) would receive subsidies to purchase insurance that met federal regulatory specifications. Under Obamacare, no federal funds are supposed to be used to help run the exchanges after January 1, 2015 (this refers to operating costs, such as providing customer service, rather than subsidies helping individuals pay for insurance coverage). The initial assumption of lawmakers was that states would have to figure out a way to make these exchanges self-sustaining. But now, at least 17 states have decided to let the federal government set up exchanges in their states, and several more are expected to follow suit. So, HHS has now devised this new surtax to pay for the costs. An HHS spokeswoman insisted to the New York Times that the fee wouldn’t translate into higher premiums. But basic economics teaches us that instead of absorbing these costs, insurers will pass them on to customers. Michael Cannon of the Cato Institute has questioned whether the administration even has the authority to impose this new tax. In proposing the regulation, HHS claimed that the text of Obamacare “contemplates” such a user fee. But as Cannon points out, the law actually only suggested user fees as a possible option for the states, while making no mention of the federal government. The relevant portion of the health care law reads: “NO FEDERAL FUNDS FOR CONTINUED OPERATIONS. —In establishing an Exchange under this section, the State shall ensure that such Exchange is self-sustaining beginning on January 1, 2015, including allowing the Exchange to charge assessments or user fees to participating health insurance issuers, or to otherwise generate funding, to support its operations.” Now that HHS officials are struggling to find ways to pay for exchanges — a cost they thought they’d be able to foist on states — they are claiming authority to impose these fees. Regardless of whether this authority exists, it’s another example of how the Obamacare’s true costs are only going to become known over time. 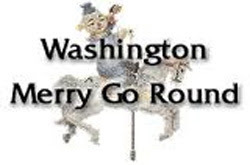 When the law was written and it said “no federal funds” after January 1, 2015, as far as the Congressional Budget Office was concerned, that meant the exchanges won’t impose recurring costs on the federal government. But, now it’s clear that there will be ongoing costs, which the federal government will impose on insurers, who will in turn raise premiums on exchange consumers who receive federal subsidies. Last December, the DOJ overturned a forty year old regulation prohibiting online wagering, noting that a 1961 rule governing sports betting could not be considered to cover modern games of online Texas Hold 'em. It was a moderate success for individual and states' rights in more than one way. Not only was the federal government leaving open the question of whether online gambling was legal- expanding the definition of legal gambling tenfold with the stroke of a pen - but now, states looking to increase revenues could consider running their own games. Obviously Nevada was the first to take the DOJ up on its offer, followed closely by New Jersey and now Delaware. But as per usual, Congress has little interest in letting individual activity go unregulated. And, recently a small band of Congressmen led by Harry Reid have decided that states should not be free to construct their own gaming schematics, but rather, the Federal government should swoop in and decide how the development of now-unchained online gaming will progress. Both the brick-and-mortar casino industry — which could perceive a threat from a sweeping expansion of its trade on the Web — and poker aficionados have thrown their support behind narrow legislation that would legalize just online poker while banning all other forms of Internet gambling. Majority Leader Harry Reid, D-Nev., and Minority Whip Jon Kyl, R-Ariz., are working on such legislation in the Senate, and Rep. Joe L. Barton, R-Texas, backs that approach in the House. There are arguments to be made. After all, state-by-state regulation can be burdensome and confusing, and there's always the question of interstate commerce, but where modern technology (and modern legal structures) might enter into the equation in private industry, the government sees no such options outside their own heavy fist. But states already have systems in place that allow them to participate in multi-state lotto and OTB programs without need for additional federal intervention via the commerce clause. Moreover, these arguments seem to apply most notably to online poker, which, according to a number of state lottery directors, would not be among the games states seek to offer their residents. After all, they say, the profit margin on poker is relatively small compared to other games. Reid’s point is clear – his bill is about Nevada jobs, Nevada money and feathering the bed of Nevada’s biggest industry. Under his bill, the only entities that would be eligible for a federal poker license for at least the first two years would be land-based casinos, race tracks and large manufacturers for gaming machines. It isn't often that the government decides that it doesn't have the power to regulate something. Perhaps we should consider the long-term implications of handing the keys of online gaming directly to the Senate Majority leaders best corporate friends before we take that step.